It has influenced some of the world's greatest magicians. It temporarily put a World War on hold. The odds of it actually happening are staggering. Best of All Worlds is not just a book about a "Magic Trick". It is an extensive, in-depth look at what Dai Vernon called "the card trick of the century." Chronicling the creative evolution of this single magical effect over seven decades, Best of All Worlds brings the history and challenges of Out of This World to light. It is a unique collection of over thirty routines -- some old, some new, some never before seen in print -- submitted by the world's leading magicians. In addition to their personal performances, the contributors have given insight into and musings about how this classic effect has influenced their magic. 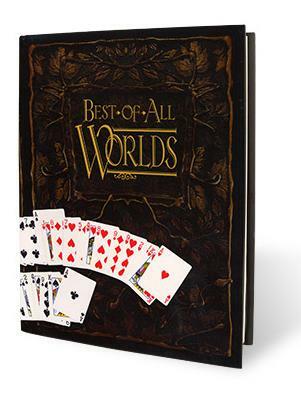 Filled with history, stories, and, most of all, magic, Best of All Worlds pays tribute to one of the greatest card tricks of all time: Paul Curry's classic card effect Out of This World. Contributions from: Aaron Fisher, Aldo Colombini, Alex Elmsley, Allan Ackerman, Allen Zingg, Arthur Benjamin, Audley Walsh, Barrie Richardson, Darwin Ortiz, Daryl, David Regal, Doc Dixon, Doc Eason, Doug Conn, Ed Marlo, Eugene Burger, Francis Carlyle, Gary Ouellet, Gregory Wilson, Harry Lorayne, Helder Guimarães, Herb Zarrow, Howard Hamburg, J.C. Wagner J.K. Hartman, Jack Parker, James Swain, Jason England, Jay Sankey, Jim Steinmeyer, John Carney, John Scarne, Jon Allen, Jon Armstrong, Joshua Jay, Juan Tamariz, Karl Fulves, Kenton Knepper, Larry Becker, Lee Asher, Luke Jermay, Mark Wilson, Martin Gardner, Martin Nash, Micah Cover, Michael Ammar, Mike Sibbernsen, Norman Beck, Norman Gilbreath, Paul Curry, Paul Green, Peter Duffie, R. Paul Wilson, Rafael Benatar, Richard Busch, Richard Kaufman, Richard Osterlind, Roberto Giobbi, Ron Bauer, Ron Wilson, Roy Walton, Simon Lovell, Stephen Minch, Steve Draun, Steve Spill, Steve Valentine, T.C. Tahoe, Tom Ogden, Tomas Blomberg, Tony Clark, Tony Giorgio, Tony Picasso, U.F. Grant, and Whit Haydn. Written and compiled by Brent Arthur James Geris, Bob Postelnik and Duppy Demetrius. There is something to be said about an effect that put a World War on hold. Out of this World is that effect. This book is all about that effect. It gives you the orginal effect. Plus dozens of professional performers versions of this effect. Be it different methods, or presentation ideas. An out of this world book! The pages with in will gave you an effect for anyplace or anywhere !this timeline classic effective trick have gave much joyful fun when magicians of the world do then in there shows! So why not have a biggest book that have the best beautiful effects form the top minds within magic! All you can say is that is just out of this world!